This article is about the Indian river. For other uses, see Krishna (disambiguation). 1,400 km (870 mi) approx. The Krishna River is the fourth-biggest river in terms of water inflows and river basin area in India, after the Ganga, Godavari and Brahmaputra. The river is almost 1,300 kilometres (810 mi) long. 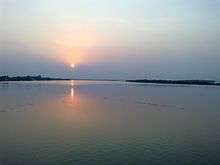 The river is also called Krishnaveni. It is a major source of irrigation for Maharashtra, Karnataka, Telangana and Andhra Pradesh. Krishna river originates in the western ghats near Mahabaleshwar at an elevation of about 1,300 metres, in the state of Maharashtra in central India. It is one of the longest rivers in India. The Krishna river is around 1,400 km in length. The Krishna river's source is at Mahabaleswar near the Jor village in the extreme north of Wai Taluka, Satara District, Maharashtra in the west and empties into the Bay of Bengal at Hamasaladeevi (near Koduru) in Andhra Pradesh, on the east coast. It flows through the state of Karnataka before entering Telangana State. The delta of this river is one of the most fertile regions in India and was the home to ancient Satavahana and Ikshvaku Sun Dynasty kings. Vijayawada is the largest city on the River Krishna. It causes heavy soil erosion during the monsoon floods. It flows fast and furious, often reaching depths of over 75 feet (23 m). Ironically, there is a saying in Marathi "Santh vaahate Krishnamaai" which means "quiet flows Krishna". This term is used to describe that a person should be as quiet as Krishna. The largest tributary of the Krishna River is the Tungabhadra River with a drainage basin measuring 71,417 km2 (27,574 sq mi), running for about 531 km (330 mi), but the longest tributary is the Bhima River, which makes a total run of 861 km (535 mi) and has an equally large drainage area of 70,614 km2 (27,264 sq mi). There are four rivers that join the Krishna at a confluence known as Preeti Sangam, or "Lover's Meeting Point" in the Satara District. These are Venna River, Urmodi River, Tarli River and Koyna River. Three tributaries meet Krishna river near Sangli. These places are considered very holy. It is said that Lord Dattatreya spent some of his days at Audumber on the banks of river Krishna. Sangameswaram of Kurnool district in Andhra Pradesh is a famous pilgrim center for Hindus where Tungabhadra and Bhavanasi rivers join the Krishna river. The Sangameswaram temple is now drowned in the Srisailam reservoir, and visible for devotees only during summer when the reservoir's water level comes down. Krishna Basin extends over an area of 258,948 km2 (99,980 sq mi) which is nearly 8% of the total geographical area of the country. This large basin lies in the states of Karnataka (113,271 km2), Telangana, Andhra Pradesh (76,252 km2) and Maharashtra (69,425 km2). 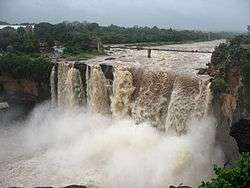 The Krishna river rises in the Western Ghats, at an elevation of about 1,337 m (4,386 ft) just north of Mahabaleshwar, about 64 km (40 mi) from the Arabian Sea. It flows for about 1,400 km (870 mi) and outfalls into the Bay of Bengal. 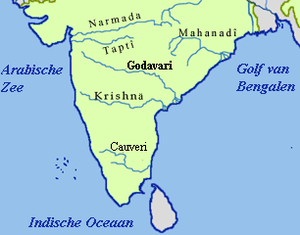 The principal tributaries joining Krishna are the Ghataprabha River, Malaprabha River, Bhima River, Tungabhadra River and Musi River. An average annual surface water potential of 78.1 km3 has been assessed in this basin. Out of this, 58.0 km3 is utilizable water. Culturable area in the basin is about 203,000 km2 (78,000 sq mi), which is 10.4% of the total cultivable area of the country. 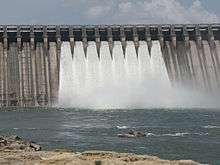 As the water availability in the Krishna river was becoming inadequate to meet the water demand, Godavari River is linked to the Krishna river by commissioning the Polavaram right bank canal with the help of Pattiseema lift scheme in the year 2015 to augment water availability to the Prakasam Barrage in Andhra Pradesh. The irrigation canals of Prakasam Barrage form part of National Waterway 4. Mullayanagiri peak in Karnataka at an altitude of 1,930 m (6,330 ft) above msl, is the highest point of the Krishna basin. This river is revered by Hindus as sacred. The river is also believed to remove all sins of people by taking a bath in this river. The centre of attraction is the Krishna Pushkaram fair which is held once in twelve years on the banks of the Krishna river. There are many pilgrimage places in Maharashtra, Karnataka, Telangana and Andhra Pradesh on the course of the river. The first holy place on the river Krishna is "Dakshin Kashi Wai", known for the Mahaganpati Mandir and Kashivishweshwar temple. It has seven ghats along the river. Temples like Dattadeva temple, which is revered by the people of Maharashtra, are located on the banks of Krishna at Nrusinha Waadi and Audumbar near Sangli. Also, located on the banks of the river Krishna are the Sangameshwar Shiva temple at Haripur, goddess Durga temple in Vijayawada and Ramling temple near Sangli, Mallikarjuna temple (Srisailam), Amareshwara Swamy temple (Amaravati (state capital)), Dattadeva temple, Sangameshwara Shiva temples at Alampur in Telangana, Ramling temple, etc. as well as, villages such as Jihe. 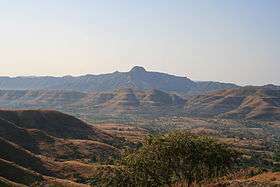 Wide spread area near to the Krishna river holds the rich flora and fauna. The last surviving Mangrove forests in the Krishna estuary have been declared as the Krishna Wildlife Sanctuary. The sanctuary is the home to the large number of resident and migratory birds. Fishing cat, otter, Estuarine crocodile, spotted deer, sambar, black buck, snake, lizards and jackal can also be spotted in the sanctuary. The sanctuary also supports rich vegetation with plants like Rhizophora, Avicennia, and Aegiceros. The following are few other wildlife sanctuaries located in the river basin. Krishna Bridge, Wai, Maharashtra – This bridge, which is located in the Dharmpuri Peth area of the town of Wai, is one of the oldest bridges that were built by the British in India. It spans the Krishna over nine kamans (arches) and is made of black rock. The bridge serves as a flood mark (when the water rises to the level of the road on the bridge) for the "Waikar" people. Irwin Bridge, Sangli – This is one of the oldest, historic and largest bridges over the Krishna that were built by the British. The Irwin Bridge, which is built of reddish stone, has two passages where one can climb down to the river in the middle of its span to view the water. Kudachi - Ugar Railway bridge built by the British in 1891. B. Soundatti Bridge, Raibag – This is also one of the oldest bridges built during the British rule. This bridge connects Maharashtra to Karnataka state. Tangadagi Bridge, This is one of oldest bridge that connects the Bijapur and Bagalkot Districts of Karnataka. God Neelambika Temple is there at the bank of Krishna River. In October 2009, heavy floods occurred, isolating 350 villages and leaving millions homeless, which is believed to be first occurrence in 1000 years. The flood resulted in heavy damage to Kurnool, Mahabubnagar, Guntur, Krishna and Nalagonda Districts. The entire city of Kurnool was immersed in approximately 10 ft (3 m) water for nearly 3 days. Water inflow of 1,110,000 cu ft/s (31,000 m3/s) was recorded at the Prakasam Barriage, which surpassed the previous record of 1,080,000 cu ft/s (31,000 m3/s) recorded in the year 1903. At present, the award of Bachawat tribunal dated 31 May 1976 is applicable for sharing the water available in the river among the riparian states. The Brijesh Kumar tribunal award given on 29 November 2013 is challenged by Andhra Pradesh in the Supreme Court and the case pending since then. Newly created Telangana state also approached Supreme Court demanding a fresh tribunal hearing to secure its water needs on equitable basis. Krishna river is one of the rivers whose water energy is harnessed to a large extent by various hydro electric power stations in India. The following is the list of hydro electric power stations excluding small and medium installations. Wikimedia Commons has media related to Krishna River. Wikisource has the text of the 1911 Encyclopædia Britannica article Kistna (river). 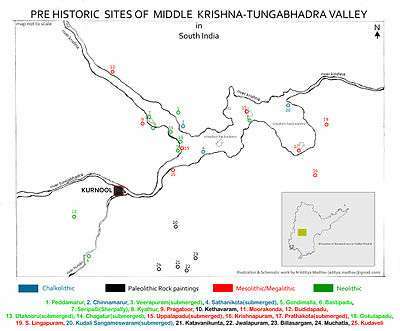 ↑ "Map of Krishna River basin" (PDF). Retrieved 27 March 2015. ↑ "Lower Krishna basin watershed map" (PDF). Retrieved 21 March 2016. ↑ "Krishna basin status report, March 2014" (PDF). Retrieved 27 March 2015. ↑ IWMI Research Report 83. "Spatial variation in water supply and demand across river basins of India" (PDF). Retrieved 23 June 2015. ↑ "Flooding along the Krishna River: Natural Hazards". earthobservatory.nasa.gov. Retrieved 11 October 2009. ↑ "Agony of Floods: Flood Induced Water Conflicts in lndia [sic]" (PDF). Retrieved 8 February 2016. ↑ "Managing historic flood in the Krishna river basin in the year 2009". Retrieved 11 October 2015. ↑ Hindu daily dated. "Court: do not publish KWDT-II decision". Retrieved 5 November 2012. ↑ "T-State wants tribunal to adjudicate water disputes". Retrieved 12 July 2014. ↑ "Headworks (Dam, Barrage,Weir, Anicut, Lift)". Retrieved 27 March 2015. ↑ "Power Houses in Krishna Basin". Retrieved 27 March 2015. ↑ "Do not kill a river". Retrieved 20 April 2016. ↑ J. Keller, A. Keller and G. Davids. "River basin development phases and implications of closure" (PDF). Retrieved 25 August 2012. ↑ "IWMI Research report nos # 1, 3, 14, 56, 72, 83, 107, 111, 121, 123, 125 etc.". Retrieved 25 August 2015. ↑ Oregon State University, USA. "Managing irrigation water quality" (PDF). Retrieved 28 August 2012. ↑ "Alkalinity and salinity bane of soil in T state". Retrieved 23 October 2015.